With the theme “Children of God: Journeying Together in Discipleship”, St. Bridget College performed its very 1st Commencement Exercise for the Senior High School Level at the Manuela Q. Pastor Auditorium, May 24. The processional march signaled the beginning of the program. The candidates for graduation were the first group to march on followed by the faculty and staff. 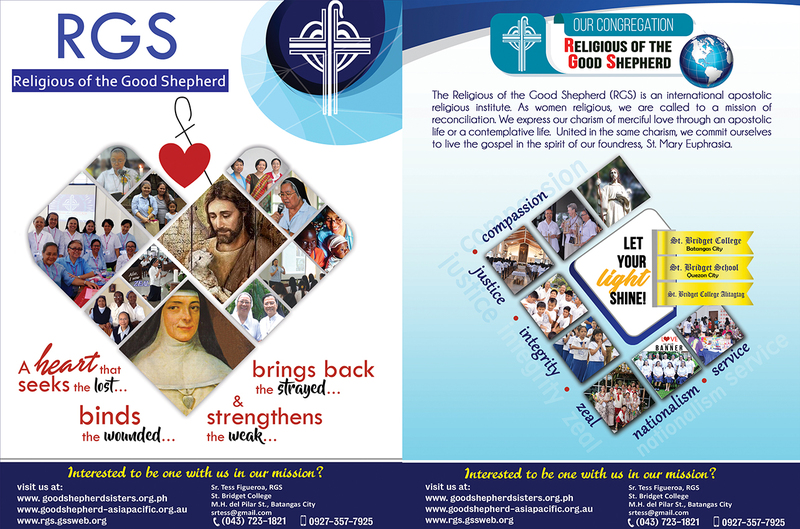 The Religious of the Good Shepherd (RGS) Sisters along with the SBC administrators and guests came in last. The entrance of colors executed by the Boy Scouts of the Senior High School came next in the program which was immediately followed by the singing of the National Anthem. Afterwards, a Eucharistic celebration was held with the purpose of blessing the candidates for graduation and their diplomas and awards. This was led by Rev. Fr. Joseph Mendoza of St. Michael de Archangel Parish in Lobo, Batangas. The mass preceded the presentation of graduates by Dr. Dolores Borras. Meanwhile, Sr. Mary Claire Bagot, RGS gave a heart-warming message to the graduates. Coming next in the program, the students were handed the fruit of their labor, their diploma. They were presented by their respective strand coordinator, Mr. Angelito Jareño for the HUMSS, Mrs. Grace Contreras for ABM and Mrs. Cenen Chavez for STEM. The non-academic awardees presented by Mrs. Geraldin Vergara, Student Affairs Coordinator received recognition and medals for their excellence in various fields. Exemplifying the spirit of St. Mary Euphrasia in her works and behavior, Carol Hilary Bobis was hailed as the St. Mary Euphrasia Awardee. Meanwhile, with the consistent exhibition of his math prowess in various competitions, Dave Samaniego was given a medal for being a Math Achiever. Furthermore, Carol Hilary Bobis, Anne Christle Garcia, Ira Claire Marasigan and Allyssa Vita Marie Silang were recognized for their most active participation in school affairs. While Katrina Marie Afurong, Mikhaela Marie Aguila, Diane Ernabel Añonuevo, Al Apolito, Euclid Reign Beredo, Azel Beatrice Cabiscuelas, Jisha Calingasan, Virgi Vladi Caringal, Ria Janelle Castillo, Aramis Espina, Perse Lior Evangelio, Danielle Hernandez, Danielle Marquez, Darylle Mendoza, Ren Christian Panganiban, Dave Samaniego, Marie Andrea Sulit, Cheene Torino, and Kristine Villena on the other hand were awarded for their active participation in school affairs. With their consistent service to their local church, LJ Noreen Abu, Miguel Brian Aguila, Ernesto Aguinaldo III, Adriel Luiz Arañez, Renz Andrei Badillo, Euclid Reign Beredo, Carol Hilary Bobis, Erlisa Caraig, Kaithea Franchette Castor, Miguel Jose Dimapilis, Bianca Riezel Garcia, Carmela Ysabelle Gutierrez, Danielle Hernandez,Winfred Gail Hernandez, Ferdinand Ian Laureta, Rica Mae Magsino, Andreu Kheilko Manalo, Don Lorenzo Mauhay, Meynard Orbino, Cheene Torino, Ellen May Virtucio and Angela Marie Ylagan became the social apostolate awardees. Exposing their outstanding skills in leadership, Euclid Reign Beredo, Anne Christle Garcia, Kristine Lei Ilagan, and Cheene Torino were given the merit award for leadership. Meanwhile, Diane Ernabel Añonuevo, Ferdinand Ian Laureta, and Don Christian Ramos received citation for leadership. Furthermore, with his consistent leadership in the institutional organization of St. Bridget College, Joshua Glen De Villa was given a medal for cultural leadership award. On the other hand, the academic awardees were presented by Mrs. Amor Borbon, Assistant Principal. The academic awardees were topped by the students who achieved with high honors who are Katrina Marie Afurong, Bianca Riezel Garcia, Kristine Ilagan, Danielle Marquez and Allyssa Vita Marie Silang. Besides the scholastic performance award, special recognitions were also given. The best research for the STEM strand was bagged by the group of Milca AJ Arce, Denice Nicole Cruzat, Criss Darylle Mendoza, Hamid Bin Maclesh Salic, and Allyssa Vita Marie Silang; the set of Sofia Anne Abaya, Lovely Princess Del Mundo, Kristine Lei Ilagan, Le-an Puertollano and Cheene Torino for the ABM strand; and, the group of Erika Len Banaag, Euclid Reign Beredo, Ramon Derrick Chavez and Julie Anne Matugas for the HUMSS strand. In addition, the best innovation was given to the group of Nica Angela Blanco, Ellaine Christine Ramos, Jansen Andrei Domingo, Paul Randolph Uy and Angela Denise Viceral. Students who excelled in their work immersion in Creotec Philippines were also given distinctions, Frances Lorraine Anglo for STEM, Cheene Torino for ABM and Maria Cecilia Makalintal. Following the program, Kristine Lei Ilagan, with high honors, delivered a message of gratitude to her teachers and her schoolmates. Afterwards, graduates took their oath which was led by Allyssa Vita Marie Silang, with high honors. The closing ceremonies composed of the singing of the graduation song composed by Ira Claire Marasigan which was dedicated to the parents and guardians of the graduates and the alma mater song, the exit of colors and the recessional concluded the program. The master of the ceremony was Ms. Fe Babao, SHS faculty.